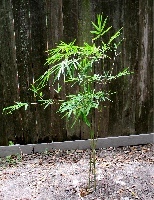 Here are two new bamboo plants we just received last week from Tropical Bamboo in Florida. The first one, show at left, is a graceful weaver's bamboo, Bambusa textilis gracilis, and the second one is a Timor black bamboo, Bambusa lako. I was most excited about getting the Timor black bamboo. When mature, it will have glossy black culms. The little one-year culms are already dark. The graceful weaver's bamboo, now that I see it, is even more enchanting. It is so graceful and lovely already! 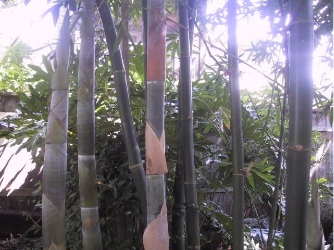 Our giant timber bamboo, Bambusa oldhamii, is six years old now, fifty feet tall,with culms that are 4.5 inches thick. It's the best thing I've ever planted. 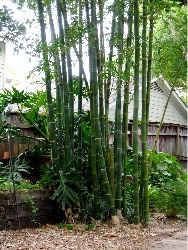 Click on the picture or "read more" to see a full-height picture of the entire bamboo! "You planted bamboo in your yard! Doesn't it spread?"